Stopped by Flying Colors Comics today and hoo-wee look at that Invader Zim #5 on the new releases shelf! Last issue for me and Aaron Alexovich! 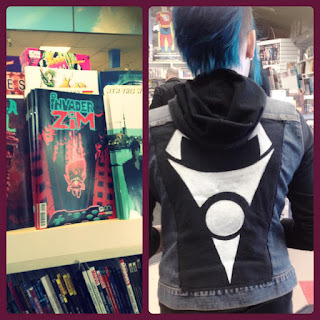 Slapping a giant Irken Invader symbol on the back of my vest seemed like a nice show of appreciation for a series that not only inspired me to get into animation, but also got me my first job in professional comics. Thanks Aaron, Jhonen and Oni Press.